In September 2012, the UN Human Rights Council adopted Guiding Principles on Extreme Poverty, which provided for the first time global policy guidelines focusing specifically on the human rights of people living in poverty. The UN Guiding Principles on Extreme Poverty and Human Rights are the first internationally agreed text to stress the central message of 17 October. Extreme poverty exists in every country in the world, and it is both a cause and a consequence of multiple human rights violations. encourage national human rights institutions and experts to use the GPs as a reference tool in their work. 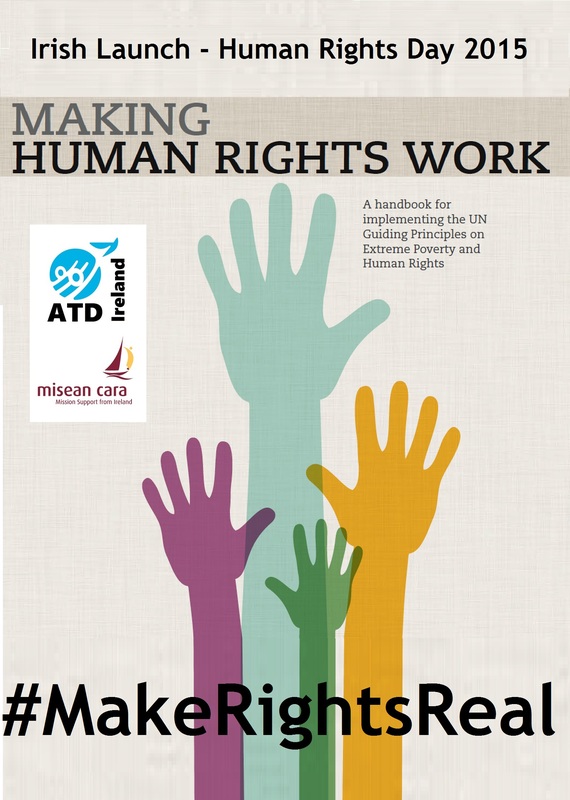 In December 2015, members of the Irish 17 October Committee and Misean Cara presented in Ireland the international handbook “Make Human Rights Work” designed to translates the set of GPs into action points that we all can use to affect change. Spearheaded by Franciscans International and ATD International, with support from Irish Aid through Misean Cara, and Edmund Rice Development, dozens of grassroots organisations worldwide, and individuals with a lived experience of poverty, have created this handbook to make human rights work for all. Launched at the UN in Geneva in September 2015, this handbook was welcomed as a resource built from the bottom-up with consultations from communities it seeks to help.